Welcome to The Gadget Professor Show #323 hosted by Don Baine. YINENN power inverter provides constant 300W AC power and 600W peak power, featuring 2 AC outlets and 2 USB ports for multi-purpose charging. Equipped with a intelligent fan that runs according to the temperature of your power inverters smartly to keep it cool. YINENN power inverter includes two 110V AC outlets for charging larger devices such as laptops and tablets, 2 USB charging ports (2.1A & 1A) for powering USB compatible devices. YINENN power inverter for car is super compact which perfect fit for vacations, work trips, camping, or your emergency kit. Space-saving and easy to store at your glove box or armrest box. Carry this convenient power inverter anywhere with you! 24 inch cigarette lighter plug makes the power inverter can be plugged into almost any vehicle. YINENN 300W Inverter Charger has safe charging design provides protection against, overheating, under and over voltage charging, short circuiting, overloads, and overcharging . Use it without risks or worries as a portable generators for home use to charge your household items or as a power inverter for the car to charge all your devices while out and about! YINENN power inverter is made of durable metal, to provide advanced protection from drops and bumps. The high-end manufacturing process makes it an ultimate car travel charger for road trips, vacations or remote work sites. Charge a wide range of power-hungry items on the road or inflate an air mattress on your campsite easily! Integrated cooling fan helps reduce heat and prevents shortages with 12 months worry-free warranty! 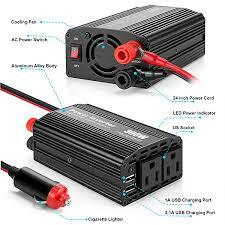 – Ultimate car power inverter for road trips, vacations, outdoors, emergency kits and more for your vehicle. Equipped with 2 AC outlets for charging larger devices such as laptops and tablets, as well as 3.1A dual USB ports for quick and easy charging. Travel-sized design is ideal for use on vacations, work trips, and camping. Featuring a universal cigarette lighter plug with long cable that plugs into almost any vehicle. Absolutely safe vehicle power inverters, due to its advanced circuitry and built in safeguards that protect your devices against short circuit, reverse-connect, over-charge, over-voltage, low-voltage, overload and over- temperature. The smart fan of this 12V to 110V converter will help reduce heat when it gets warm.